A riot of sound and colour, Varanasi is India’s most holy city. Lying alongside the banks of the River Ganga it is believed to be the oldest living city in the world, in that it exists for the same purpose as it has done for thousands of years. Our pick of the best places to stay in Varanasi are all located in a quiet part of town yet within easy reach for exploring its fascinating sights. A dip in the Ganges is believed to absolve the bather of their sins and it is considered particularly auspicious to die or to be cremated here. Every day hundreds of Hindus line the ghats leading down to the river to wash themselves in the absolving waters of the Ganga or to perform religious poojas on behalf of the deceased. But far from a morbid place to visit, it creates an incredibly intimate insight into Hinduism in practice. Whilst Varanasi may not be for everyone, persevere and this enigmatic city may well turn out to be your favourite stop. Either way, it is an unforgettable visit. As you walk along the busy, narrow streets of Varanasi you will pass sadhus (Hindu holy men), plenty of cows and those seeking alms. Whilst not for the faint-hearted, it is an intoxicating experience. Take a boat out on the Ganges for the evening aarti, a fire ritual in honour of Lord Shiva. The flickering fires, innumerable candles, in addition to the funeral pyres lining the banks of the river and hypnotic ragas, make this a truly profound experience. Our pick of the best places to stay in Varanasi are all luxurious stays located away from the main thoroughfare of town. Be sure to visit the Sankat Mochan Temple, the Manikarnika Ghat and the Tibetan Temple. A trip to Varanasi wouldn't be complete without wandering down the Banaras Ghats steps. Culture-vultures should definitely head along to the Archaeological Museum, the Kriti Gallery, and the Ruchika Art Gallery. 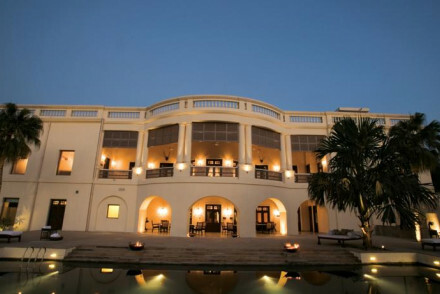 Set amidst mango and jasmine orchards Nadesar Palace is a truly regal stay. With your own personal butler, a spa boasting award-winning treatments, magnificent bedrooms, and fine dining this truly is a stay fit for a maharajah. Tree of Life Resort & Spa, Varanasi, boasts immaculately designed suites with lovely views and a top-notch restaurant. What more could you possibly want? Always a reliable place to rest one's head Taj Gateway provides world-class service at an affordable price. A safe bet in a capricious city. 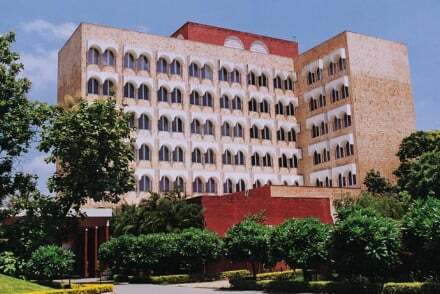 The Gateway Hotel Ganges Varanasi enjoys beautiful surroundings, surrounded by over 40 acres of landscaped gardens. The rooms are contemporary chic in style, whilst there's also a large pool to help you unwind. You can fly into Lal Bahadur Shastri Airport, which is served by daily flights from Delhi, Kolkata, Bengaluru and Hyderabad. The best time to visit is during the winter, from November to March. It's absolutely scorching from April to July, whilst monsoon season is from July to September. If you fancy seeing more of the area then consider hiring a car with Rentalcars. From contemporary to luxury, browse through our list of the best places to stay in Varanasi and start to plan your trip. Widen the net to search through our list of the best places to stay in West Bengal. Set in 40 acres of beautiful landscaped garden and constructed in the holy Swastik shape this marvellous hotel is the perfect peaceful base for exploring the magical, but hectic city, of Varanasi. The recently refurbished rooms are contemporary & chic with views of the lawns or large pool. Secluded setting - The hotel is 6 kms away from the city centre. A haven of peace and tranquility in this crowded and ancient temple city. Sights nearby - Countless temples & museums. At dawn & dusk religious rituals take place in the Ganges. Not to be missed. Set just outside the spiritual mecca of Varanasi this new addition to the Tree of Life Resorts is an oasis of calm. Comprising 18 immaculately designed suites all boasting lovely views over the manicured gardens and pool. Offering exceptional cuisine, ever-attentive service and on-point design. 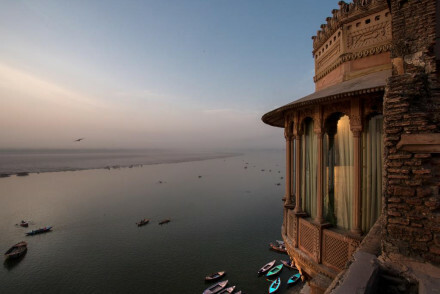 A spectacular former palace, turned luxury hotel in the holy city of Varanasi. 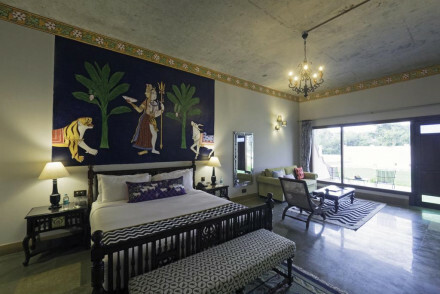 With an unbeatable location overlooking the river Ganges, the regal rooms offer window bays for watching the world go by. The mouthwatering vegetarian food will leave even the most carnivorous guests satisfied. Sublime. Staying at this magnificent palace with its fleet of butlers you won’t help but feel like one of the royals, statesmen or celebrities that have sojourned here. Set amid mango orchards & jasmine fields it boasts a spa, pool and rooms with four poster beds, handmade furniture & huge marble baths. Spa - On offer at the Jiva Spa is a signature treatment ‘Abhisheka’ inspired by time-honoured Indian purifying rituals. Great walks - Take a guided walk with the hotel's very own botanist around the Palace lawns & learn about the unique flora. Sights nearby - Do not miss the dawn & dusk religious rituals in the Ganges (Ganga Aarti). Countless ancient temples.